A marriage proposal will (hopefully) only happen once in your lifetime, so you'll want it to be memorable and perfect. After you've worked up the nerve to ask, you need a romantic way to pop the question. 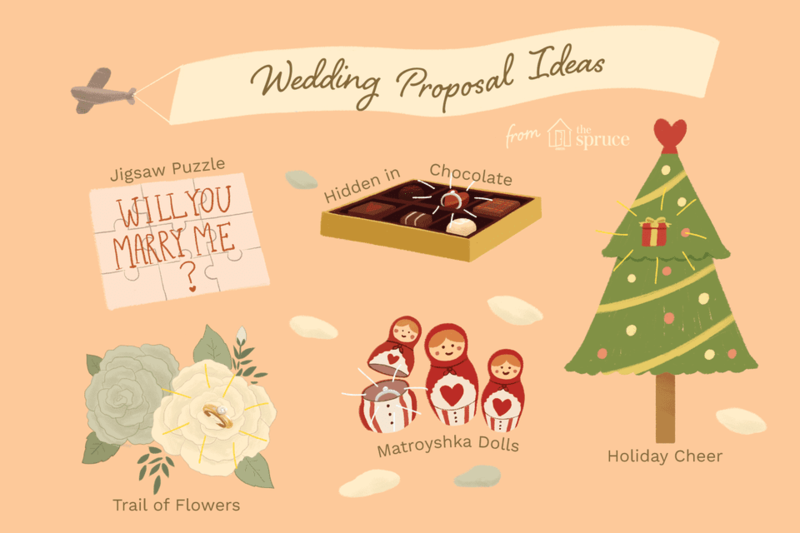 Consider some creative marriage proposal ideas that are sure to make a big impression. "We've had an amazing journey together so far. Now I think we're ready to take the next step in that journey, and I'm hoping you'll do me the honor of marrying me." "Wait, there's still one more present." Ask your intended to find it or simply retrieve it and propose. Another holiday marriage proposal idea is to wrap the ring box inside several bigger boxes, like Russian nesting dolls, so your sweetheart will think the present is very large. As each layer is opened, the laughs will grow. Get down on one knee right as the last box is opened. "Your question is: Will you marry me?" rather than the question written on the card. Scavenger hunts are always an entertaining marriage proposal idea. Start off with a simple clue to someplace nearby, then get more complicated as the scavenger hunt progresses. Have the final location be a place where you can hide, and then pop out and get down on one knee. Spell out the marriage proposal in some place your sweetheart isn't expecting to see it, perhaps using alphabet refrigerator magnets, writing it in lipstick on the bathroom mirror, using glow-in-the-dark stars to write it on the bedroom ceiling, or getting up early and slipping a fake newspaper page into the real newspaper. Create a path to the engagement ring. For example, scatter petals from the front door to the bedroom and use more petals to spell out "Will you marry me?" Alternatively, you could use candles to trace a path, but be careful and don't burn the house down. "For all these reasons and more, I want to spend the rest of my life with you. Will you marry me?" Write it on a jigsaw puzzle. Print "Will you marry me?" on a custom jigsaw puzzle on Shutterfly or Portrait Puzzles, and have your sweetie solve it. Buy a box of chocolates and replace one chocolate with the ring. When your sweetheart opens it up, get down on one knee to finish the job. You could also hide the ring box in a carton of eggs. When your fiance-to-be goes to make breakfast, be ready to drop to one knee. Most movie theaters have repeating advertising slides before the previews that can be purchased. Pay for a slide and be sure to get to the theater early enough. Get a street busker to sing "Will you marry me?" as you walk by. Ask, "Do you hear what he's singing?" Then drop to one knee and pop the question. Plan a surprise trip using blindfolds and circuitous routes. When you get to your destination (hopefully, a beautiful, secluded spot), pop the question. If you're planning to stay overnight, don't forget to pack a bag for your sweetheart. Restaurants are often very popular places to propose. Call beforehand and get their advice on the best way to propose in their restaurant. Perhaps the proposal is written out on a plate or the waiter delivers the ring along with your entrees. At the beach, tell your sweetheart that you are going to draw a picture, but not to look yet because you want it to get it right. Write the marriage proposal in the sand, then reveal what you've created. Pack a romantic picnic and put the ring in with the dessert. After a leisurely meal, ask your honey to get out the dessert. Skywriting is wonderful way to propose. You can have an intimate and private marriage proposal while still proclaiming your love to the world. Another alternative: get a plane to fly a banner with "Will you marry me, ___?" over your town. For a wintery marriage proposal when there's snow on the ground, pack the snow into letters or take a squeeze bottle filled with red colored water and spell out "Will you marry me?" in the snow.